Discolouration of the surface of Stainless Steel that does not affect the stuctural integrity or the longevity of the material. The relationships between the contributing factors are complex. But generally become increasingly critical closer to marine water. Tea staining occurs most commonly within about five kilometres of the surf and becomes progressively worse closer to the marine source. However, wind exposure, pollution levels and higher temperatures can create environments where tea staining might occur 20 kilometres or more from sea water. These same factors also increase corrosion rates of alternative materials. Rough surface finishes promote tea staining: the smoother the surface, the better. Smoother surface finishes stay cleaner between washes and don’t have deep surface grooves where chlorides and other contaminants can collect and cause problems. Pickling treatments after welding are a must for good performance of stainless steel near the coast. 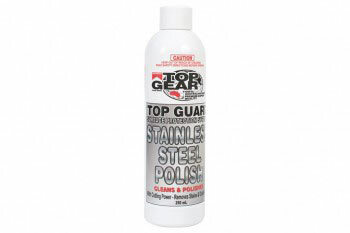 This chemical treatment removes the welding oxide and rapidly restores the passive layer, which gives stainless steel its corrosion resistance. Even smooth stainless steel finishes in coastal environments may show tea staining if not washed regularly. Good designers will avoid crevices, such as intermittent welds and areas where water can collect. Competent stainless steel fabricators will avoid carbon steel contamination. 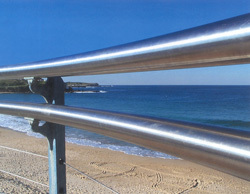 Choose designers and fabricators experienced with stainless steel. Exposure of a particular grade of stainless steel to a more aggressive environment than it can resist will contribute to tea staining.